During three seasons of increasing popularity, the ghost hunting television show King Paranormal Investigations has come to be known to explore dangerous environments. The team is Lucas King – the face of the show, Harrison Knight – the trusted veteran, and Jeff Blake – the technology wizard. Their three personalities blend well and make for compelling television. When – during the break between seasons three and four – the team receives a letter describing a haunted mining town and the curse that has followed a family for 100 years, how could they not explore it? Joined by Cole Ballard, the last surviving member of the cursed family and their equipment tech, Jimmy Vargas, the team sets about investigating the paranormal happenings in Coldwater, California. Paranormal reality shows have become all the rage, with programs like Ghost Hunters, Ghost Adventures, Dead Files and Haunted Collector fighting for supremacy. In this environment of one-upmanship, producers are searching for the most dangerous settings possible. But what happens to the stars of a reality television show when they are confronted by a truly malevolent force? Can they be protected by superior technology? Or will demons finally show the true scope of their evil to a television audience? Armed with the latest ghost hunting gear and more than 20 years of experience between them, King Paranormal Investigations prepares for their most terrifying episode ever. Coldwater, California. Steve Metcalf is the author of five books, including two National Novel Writing Month winners. 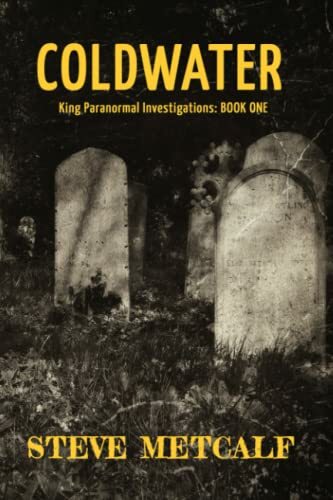 His latest, Coldwater, represents his second consecutive win and his first novel in the horror genre.